The Declaration of Independence went through several revisions before it was published in the form that we know it today. 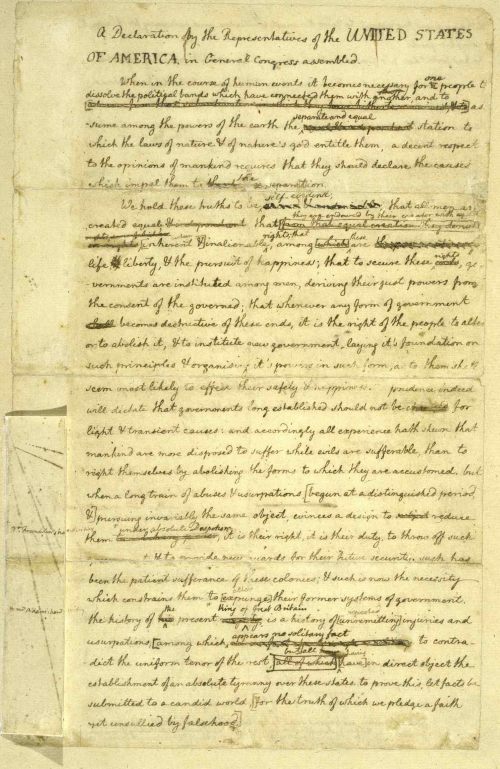 After Thomas Jefferson wrote his original draft, he gave it to John Adams and Benjamin Franklin for their revision. 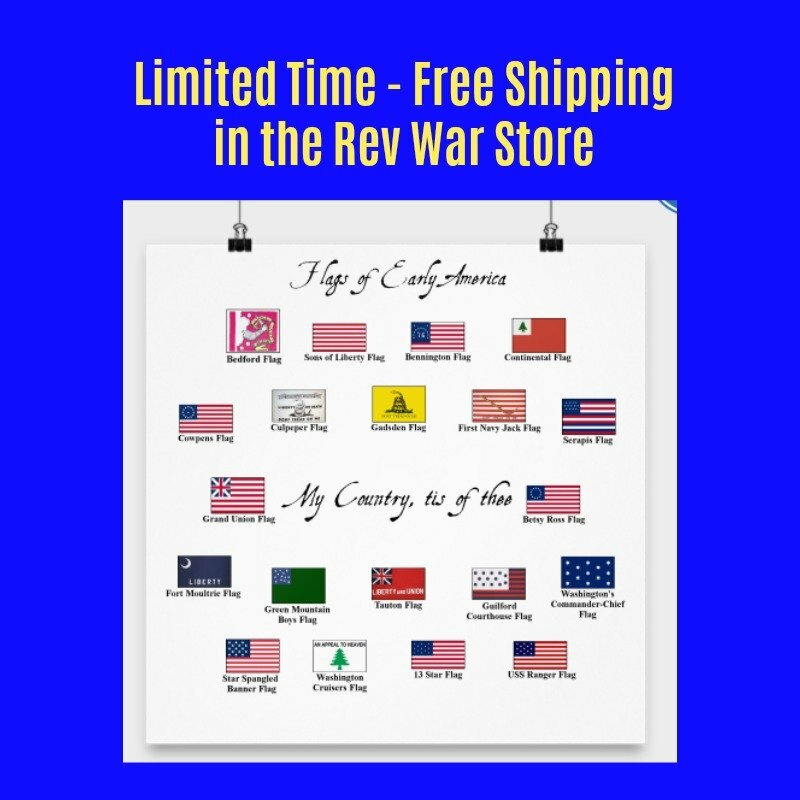 The three of them, plus Robert Livingston and Roger Sherman, made up the Committee of Five, that was charged with writing the Declaration of Independence. 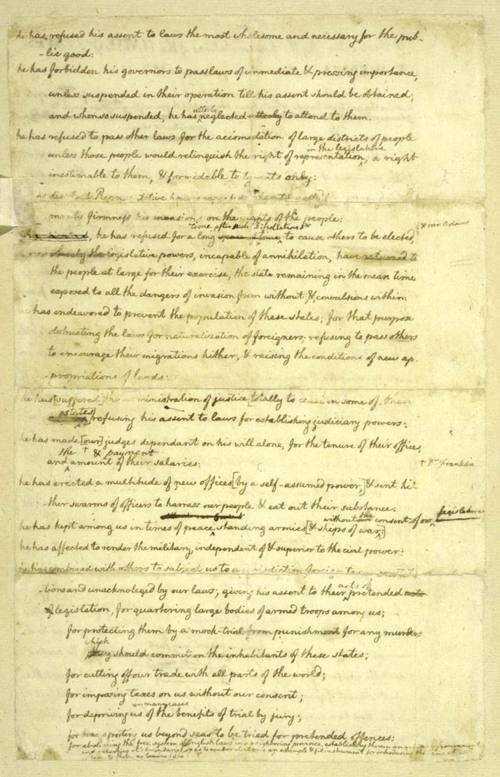 After Franklin and Adams made their revisions, the document was presented to Congress. 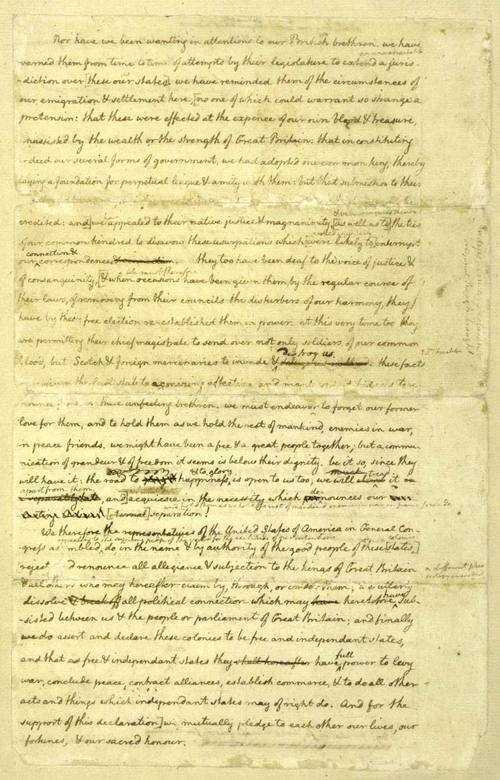 This version has come to be known as the "Rough Draft" of the Declaration, which you can read below. When Congress received the Rough Draft, they debated it and made their own amendments, most notably leaving out a section that condemned the British public for allowing their government to treat their American brothers in such a tyrannical fashion and a section that would have abolished slavery. 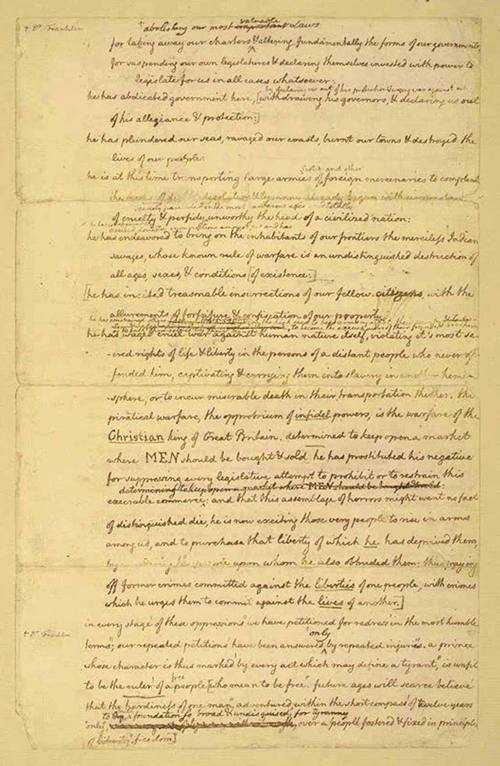 You can read Thomas Jefferson's original draft of the Declaration of Independence here, and you can read the final version of the Declaration of Independence here. 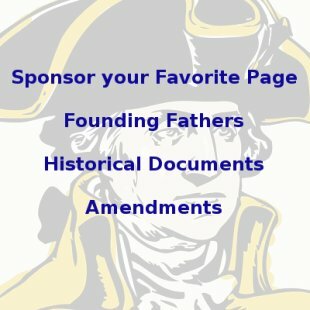 You can also read about how Thomas Jefferson created the Declaration of Independence. We also have an interesting list of Thomas Jefferson Facts. Or, you can read some Thomas Jefferson Quotes, or John Adams Quotes here. that they should declare the causes which impel them to ^ change. for the truth of which we pledge a faith yet unsullied by falsehood. He has neglected utterly to attend to them. opposing with manly firmness his invasions on the Rights of the People. urges them to commit against the lives of another. 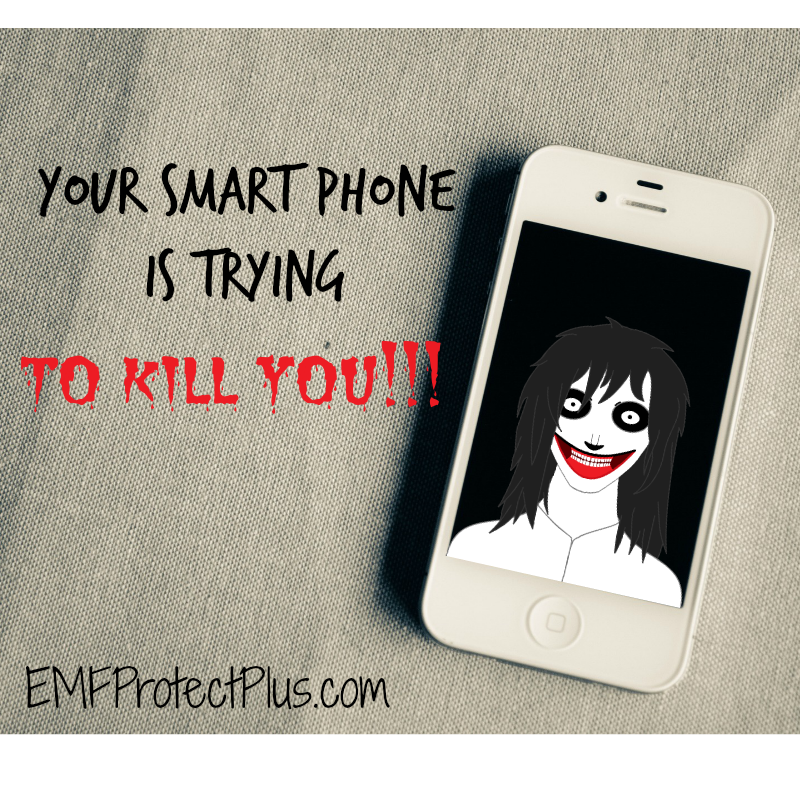 necessity which pro^nounces our ^ everlasting adieu! other acts and things which independent states may of right do. other our lives, our fortunes, & our sacred honor.